Finding Nemo is one of our all time favorite Disney films and we can't wait to catch Nemo, Marlin, Dory and all of their friends in their new 3D "splashtacular"! On Thursday, July 12th, Disney•Pixar held an advance private screening of Finding Nemo 3D for the U.S Olympic Swim Team in Knoxville, TN. The Olympians and their families were one of the first audiences to "Sea" the film in breathtaking digital 3D before heading out to compete in the London Olympic games. Now, that's a fin-tastic send-off! Disney•Pixar's "Finding Nemo" dives back into theaters and homes this year in breathtaking Digital 3D™. The must-"sea," must-own Oscar®- winning underwater adventure – featuring the unforgettable Marlin, his forgetful friend Dory and the lovable young Nemo – returns to the big screen in a spectacular 3D theatrical release beginning September 14,2012, and then swims into living rooms for the first time ever in high-definition Blu-ray, Blu-ray 3D, and Digital platforms on December 4, 2012. Above video: Dory, Marlin and a school of fishy friends joined Team USA to create splash-tacular PSA encouraging swimmers everywhere to "Just Keep Swimming!" As the National Governing Body for the sport of swimming in the United States, USA Swimming is a 300,000-member service organization that promotes the culture of swimming by creating opportunities for swimmers and coaches of all backgrounds to participate and advance in the sport through clubs, events and education. Our membership is comprised of swimmers from the age group level to the Olympic Team, as well as coaches and volunteers. Members can get involved through our more than 2,800 clubs across the nation. USA Swimming is also responsible for selecting and training teams for international competition including the Olympic Games, and strives to serve the sport through its core objectives: Build the base, Promote the sport, Achieve competitive success. 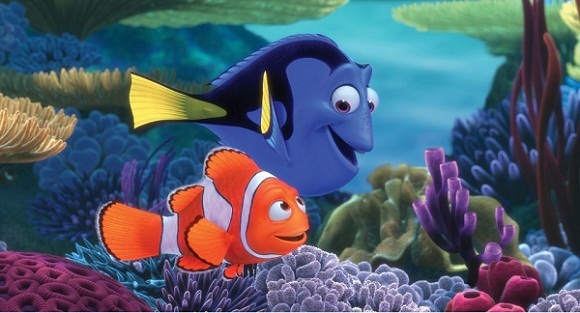 Finding Nemo 3D swims into U.S. theaters September 14th, 2012!